The EarthSky article Great Pacific Garbage Patch now 3 times size of France links both to the newly published article in Scientific Reports Evidence that the Great Pacific Garbage Patch is rapidly accumulating plastic and to the YouTube video of one of the authors Boyan Slat - The New Picture of the Great Pacific Garbage Patch (2018), which discusses both data collection and analysis, and the possibility and scope of potential cleanup efforts of a huge patch of garbage within the North Pacific Subtropical Gyre. 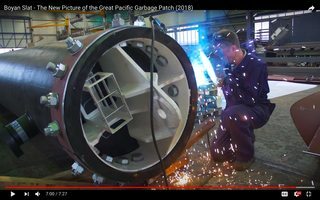 Near the end of the video, after 07:00 is shown a very large structure being welded. It's been humorously named Boomy McBoomFace in reference to the RRS Sir David Attenborough story and the UAV Boaty McBoatface. Is this boom part of a subsequent garbage collection experiment, or a cleanup prototype, or something else? 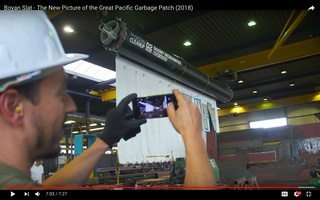 The Ocean Cleanup deployed a 100 meter-long barrier segment in the North Sea, 23 km off the coast of The Netherlands on the 22nd of June 2016. To investigate the durability of our design, we deployed a system segment in the North Sea. At this test site, conditions are more severe than those in the Pacific Ocean, due to the North Sea's strong tidal currents, and the test site's short, steep wave patterns. During an inspection of the North Sea prototype in August, we noticed the two outermost air chambers were bent out of shape. Thanks to underwater footage we were quickly able pinpoint the cause; shackles had disconnected from the mooring, which increased the forces on the ones remaining as well as the floater. After our diagnosis, we continued to closely observe the situation and decided to take the barrier back to shore after close to two months. The design has changed since (bottom of page). * A long pole, often heavy, e.g. along the foot of a sail. In this case, sheets/screens are hanging down from it. Jan Doggen's answer identifies some sources that tell a bit more about Boomy itself, so I'd like to address overall what a boom actually is in this context, and make an educated guess about the purpose of Boomy. A boom, in this context, is a large floating device intended to surround or block an area of water, keeping surface contaminants either in or out (depending on the application). Most commonly they are used in isolating oil spills, or protecting sensitive locations from oil. Oil floats on water, and a floating boom creates a surface barrier which effectively blocks the oil from spreading. This page from the National Oceanic and Atmospheric Administration (NOAA), a division of the United States government, explains the various types of booms commonly used in environmental cleanup. Booms are floating, physical barriers to oil, made of plastic, metal, or other materials, which slow the spread of oil and keep it contained. There are three main types of boom. Hard boom is like a floating piece of plastic that has a cylindrical float at the top and is weighted at the bottom so that it has a "skirt" under the water. If the currents or winds are not too strong, booms can also be used to make the oil go in a different direction (this is called "deflection booming"). Sorbent boom looks like a long sausage made out of a material that absorbs oil. If you were to take the inside of a disposable diaper out and roll it into strips, it would act much like a sorbent boom. Sorbent booms don't have the "skirt" that hard booms have, so they can't contain oil for very long. Fire boom is not used very much. It looks like metal plates with a floating metal cylinder at the top and thin metal plates that make the "skirt" in the water. This type of boom is made to contain oil long enough that it can be lit on fire and burned up. 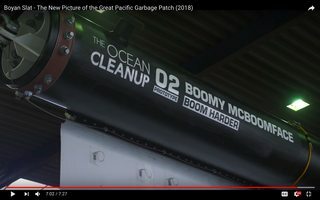 With that in mind, and considering the context of Boomy McBoomFace having something to do with the Pacific garbage patch, I think it is safe to theorize that Boomy is being designed to help collect garbage floating at the surface in a similar manner to how the booms described above collect/block oil. Not the answer you're looking for? Browse other questions tagged ocean oceanography pollution or ask your own question. What causes bottom water to rise? What are the temperature and pressure conditions an ROV design would have to deal with to descend to 4000m? What are black-hole ocean eddies? What are baroclinic and barotropic waves? What is the average depth of the ocean? How much garbage goes into the Pacific Ocean every year? What do physical oceanography grad schools look for?